I recently presented 44 paintings in a solo show at the Yellow Barn at Glen Echo. Friends who were unable to attend the show have asked for a chance to see the paintings. I’ll include dimensions, media, prices a little later in the week. This painting expresses the theme using a series of related images. In the background, I placed a set of nine doors, each one tentatively opening, and each representing a different culture: there’s one from Ireland, one from Morocco, one from Sub-Saharan Africa, one from a Navaho hogan, and so forth. The one in the center is based on Tolkien’s drawing of the stone doors to the Mines of Moria, the ones with the inscription, “Speak ‘Friend’ and Enter.” The door in the lower right is the door to the Washington Ethical Society. There’s some creative ambiguity in the question of whether the doors are opening to accept a delivered invitation (particularly to people different from ourselves), or to offer hospitality to a traveler. 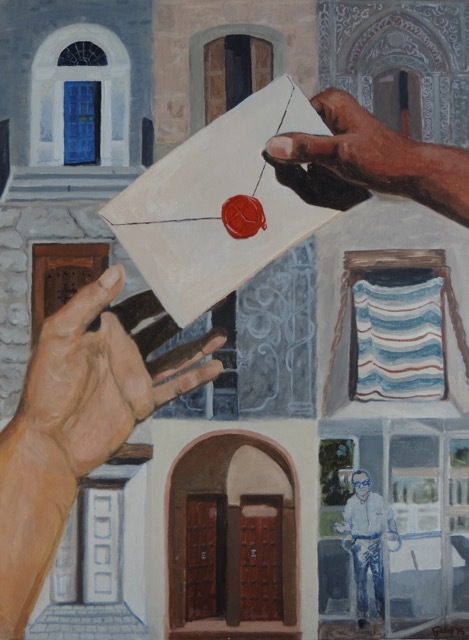 In the foreground are the hands of two individuals giving and receiving a sealed envelope; the seal on the envelope reveals that it’s an invitation to Humanism. It wasn’t until I finished the painting that it occurred to me that the recipient of the envelope could be either of the two hands! Creative ambiguity, again. The first image that came to me in response to this theme, inspired by the season we’d just entered, was of fall leaves: the tree lets them go as winter approaches and they begin to die (and, of course, the death of the leaves and the approach of winter are metaphors for many forms of “letting go”). 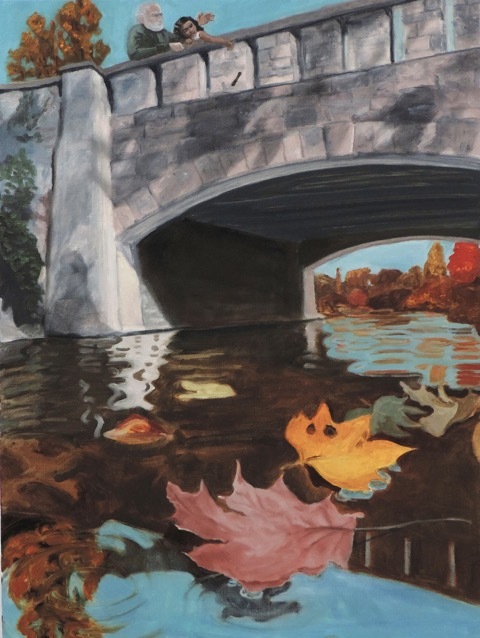 Placing the leaves on the surface of a stream let me express the feeling of letting our obsessions and pain slip off and “float away downstream.” Once I had a stream, it was a simple matter to add a bridge, calling to mind “water under the bridge,” an expression meaning things that are past and which should be allowed to stay in the past. On the bridge is a child letting go of a twig as she plays “Pooh Sticks” (which is a race to see whose stick will emerge from the downstream side of the bridge). At first, I was going to show two children, but then I had the idea of showing the child’s parent, reluctantly letting go of her as she grows. 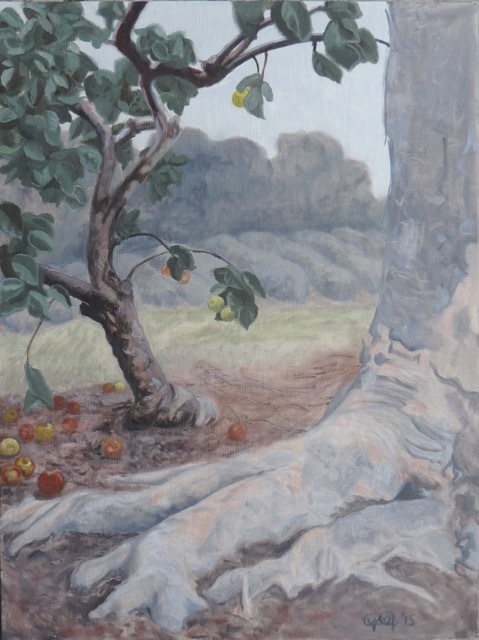 For Ancestry, I chose to do a painting of an orchard because trees happen to be a rich source of metaphors for our ancestry. In the foreground, we see massive, stable roots. The main subject is an apple tree, standing amid its progeny – illustrating the proverb about the commonalities of children and their parents: “The apple does not fall far from the tree.” The branching tree also refers to the evolutionary tree, a model for the divergence of species from their common origin. Finally, you will note that I show this particular tree producing apples of several different types. Apples, as it happens, are generally grown by grafting twigs of a desired variety onto a sturdy rootstock, and there is nothing to prevent us from grafting twigs from several different kinds and colors of apples onto the same tree. I see this as analogous to adoption in a human family: though the children might have come from different birth families, and look different from their adoptive parents, they can still all thrive together. My first association for our December theme was the set of expectations that comes with the holidays. I often feel an eager anticipation for the delights of the season, expressed by the colorful gifts. But these expectations – that we’ll have particular decorations, gifts, treats, and even emotions – can also be daunting. I’ve expressed these sometimes overwhelming emotions by piling the gift-wrapped packages into a looming mountain. I also wanted to work in the often-troubling expectations that society imposes on us: that our lives should follow a standard, one-size-fits-all path. Starting at the bottom of the pile, the patterns on the gift wrap symbolize a baby shower, then a birthday party, a graduation, a wedding, the next generation’s baby shower, and finally a retirement party. I placed an expectant mother in the picture as well, showing one of the most exciting kinds of expectation. 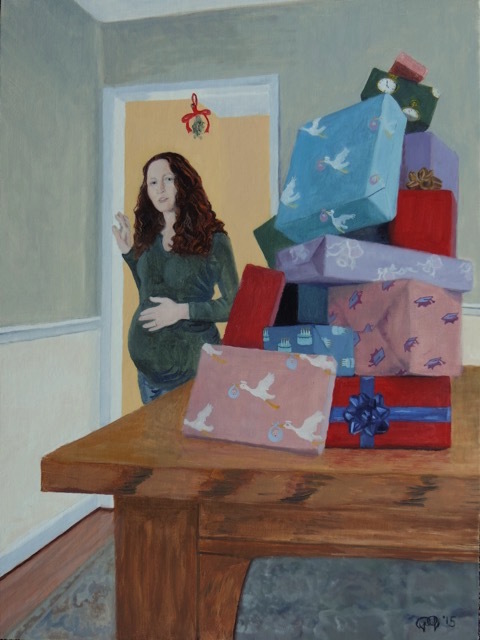 And, for a little more holiday cheer, I posed her underneath a sprig of mistletoe – expecting a kiss! The first image that came to my mind for “Resistance” was a rock, standing firm against a torrent. 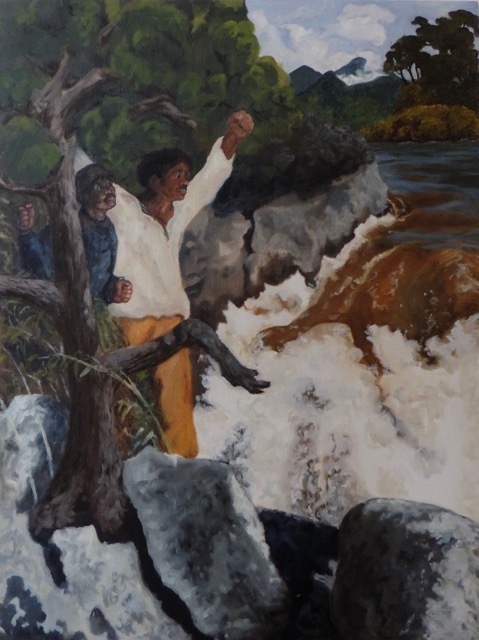 I’ve placed a tree on an outcrop above the rapids, referring to the “tree that’s planted by the water” in the civil rights and labor anthem “We Shall Not Be Moved.” The tree’s broken branch warns against resisting too rigidly – the ability to bend without breaking, like the bamboo, can be more effective. The tree is growing in a crevice in a boulder, slowing forcing apart the resisting rock – a reminder that growth often requires us to work against entrenched habits or institutions. I also had in mind our Ethical Society’s sister community in El Salvador. We are supporting the people of El Rodeo as they resist the mining companies threatening to degrade El Salvador’s largest river. The distant landscape is based on a scene from Central America. The two figures stand for everyone resisting oppression. I took them from Francisco Goya’s monumental painting of the execution of Spanish resistance fighters, “The Third of May, 1808.” I made two changes: a gesture of despair or supplication in the original became a defiant, clenched fist, and I raised them from their knees to stand fully upright. 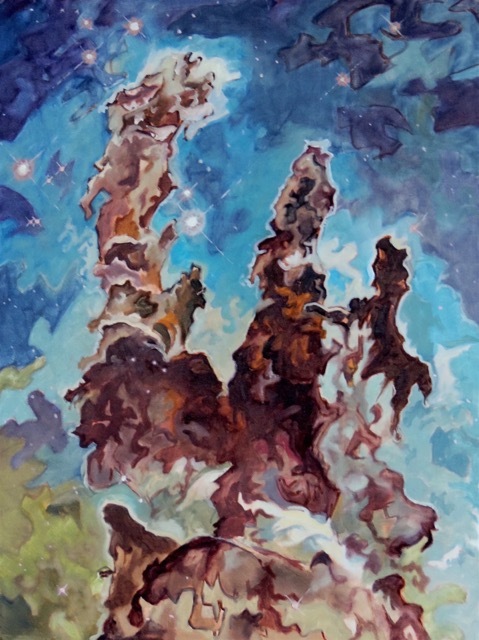 My painting on the theme of Desire seeks to touch on the full panoply of its meanings through a symbolic representation of the Greek myth of Zeus and Danae. In this myth, Zeus casts his roving eye on a mortal woman, whose father has locked her away to keep her chaste. Zeus comes to her as a shower of gold, and she conceives a child – Perseus. It has long been a favorite subject for artists aiming for a sensual yet respectable image. 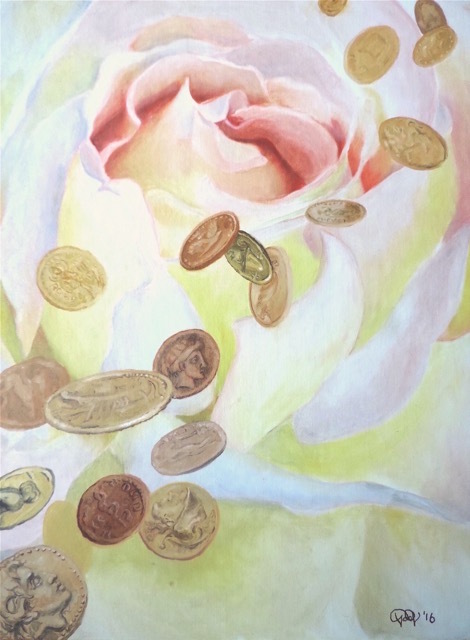 I’ve represented Danae (and female desire) as a blushing rose, and Zeus as a shower of (mostly) Greek gold coins. The coins represent various things that we mortals desire, too: the gold represents wealth; Aphrodite and Venus stand for beauty and love; Alexander the Great is power; Athena’s owls are for wisdom; birds (and Perseus’s mount, the Pegasus) for freedom; the Rod of Asclepius represents a passion for healing and other helping vocations; an ancient galley for wanderlust, and so on. Our paradoxical desire to escape from desire altogether is shown by a single ancient coin – somewhat apart from the rest – that portrays the Buddha. Birds, through their ability to fly over obstacles and defy the gravity that keeps us earthbound, are a natural symbol of liberation. I show several kinds of birds soaring over a high stone wall, suggestive of an escape from imprisonment. A barred gate in the wall, its shape suggestive of a birdcage, is partly open, offering another representation of liberation. The individual birds have their own symbolism. The bald eagle, for example, represents our political independence, and the owl, triumph over ignorance. The pelican, though its reputation for self-sacrifice, represents escape from egotism. In Buddhism, the peacock is associated with Bodhisattvas – who achieve liberation from the cycle of death and rebirth, and help others to do the same. 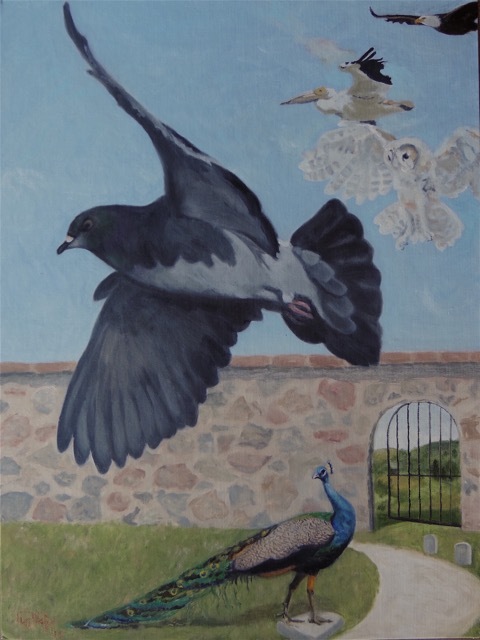 In Western tradition, the peacock is a symbol of immortality, and hence of liberation from death; I show it surmounting a fallen gravestone. I took the scene in the foreground – with the wall and the gravestones – from a small battlefield cemetery holding the remains of Union soldiers who died defending Washington, DC, a century and a half ago. It thus alludes to the struggle to liberate millions of Americans from slavery. This painting departs substantially from my previously images, and intentionally so. For “creativity/creation” I wanted the painting itself to express my own creativity; I thought a good way to accomplish that goal would be to move toward abstraction, which can be radically free from the constraints of reproducing scenes from nature. 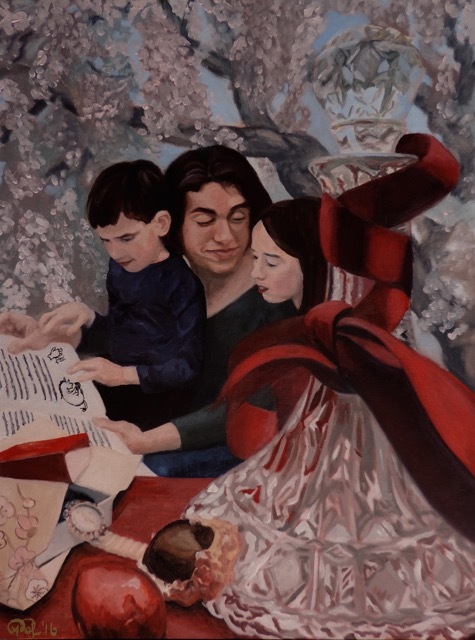 This painting points up the contrast between gifts that are material luxuries and the much more valuable gifts of authentic life and human feeling. The foreground still life shows a fancy crystal decanter, a jeweled watch with floral wrapping paper, and foil-covered chocolate hearts. In the middle ground is a mother offering the gift of time, as she gives her heart to her children. And in the background, the gifts of nature overshadow the cherry blossoms printed on the wrapping paper. The book they’re reading together is Winnie-the-Pooh, (written by A.A. Milne, with illustrations by E.H. Shepard). They’ve reached the end of the story in which Eeyore gets birthday presents from Pooh and Piglet. The givers feel terrible about how pathetic the presents are: a pot from which Pooh has accidentally eaten all the honey, and a big red balloon that burst when Piglet tripped. Astonishingly, Eeyore is thrilled! We never know which gifts will mean the most to our loved ones. Thinking about how to portray simplicity, I began by considering the sphere: it has no front or back, no corners, no facets, no inside. 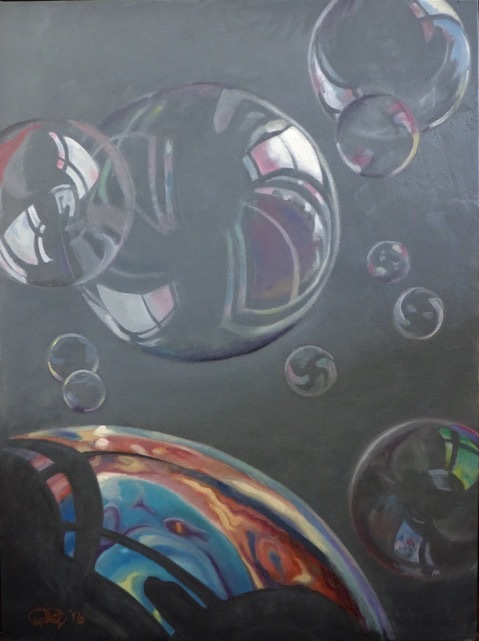 To show spheres in a painting, I hit upon the idea of using soap bubbles – not only do they naturally form spheres, but they also reflect the world around them in iridescent colors. They are so insubstantial – just a few molecules thick! – that they’re able to float in the air; their weightlessness underscores to me the idea of simplicity. Soap bubbles bring to mind the child’s pastime of blowing clouds of bubbles and then running to pop them. I associate childhood with a simpler time; who knows whether that association is accurate? Designing and executing the actual painting, though, had its ironic side. Though I tried hard to make the painting itself simple – just one repeated shape, no background, no child blowing the bubbles – difficulties kept creeping in. The eye is so good at detecting asymmetries and other deviations from the ideal that the curves and reflections have to be rendered very carefully to avoid breaking the illusion of a bubble. And the rainbow sheen that seemed so simple in my imagination was devilishly complex to portray. I suppose it’s good to be reminded that simplicity is, very often, itself an illusion.